There are many great dxing tuners out there, but I'm going to focus on three and compare them: the Onkyo T-4711 , Onkyo T-9090 Mark II, and the new Sony XDR-F1HD. All are exceptional in their own right. Onkyo T-4711 (1996, $600, black, gold, owner's manual) A digital tuner with excellent sensitivity and selectivity, the T-4711 has 6 ceramic filters and is a great tuner for DXing, especially when modified. It was available in a typical black cabinet or in a "50th anniversary limited edition" gold cabinet. The T-4711 has switchable wide and narrow IF bandwidth settings, a hi-blend switch, fine tuning in 25 kHz steps, a timer and a remote control. It also has RDS (Radio Data System), described in the T-4310R writeup above. Here is a website with some suggested mods for the T-4711, but don't try filters this narrow if you care at all about sound quality. 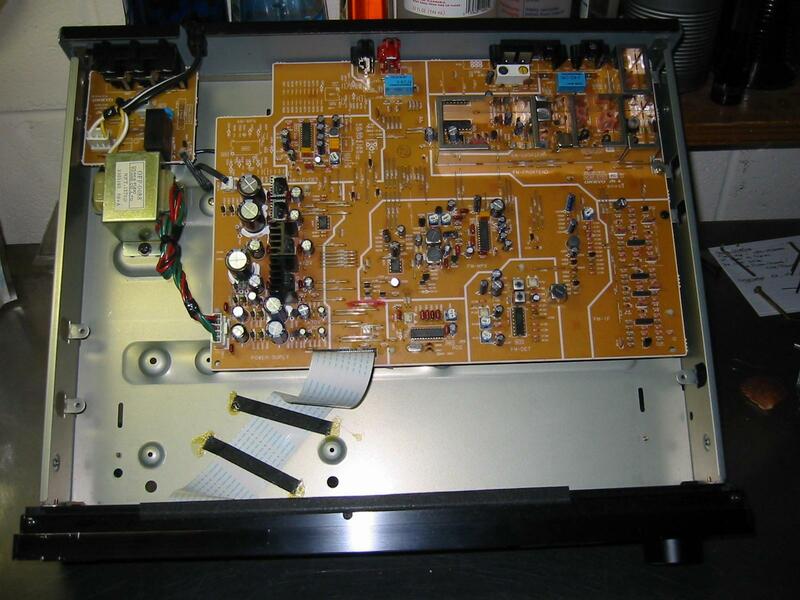 Our contributor Ken K. found his T-4711 to be more sensitive and selective than five excellent Yamaha tuners: "In order of FM selectivity, I rate the Onkyo the best, then the T-85 (then the TX-1000, TX-950, T-7, and T-1). Of the two contendahs, the T-85 just doesn't quite match the ability of the Onkyo to hold a weak adjacent station without splatter next to a strong local. 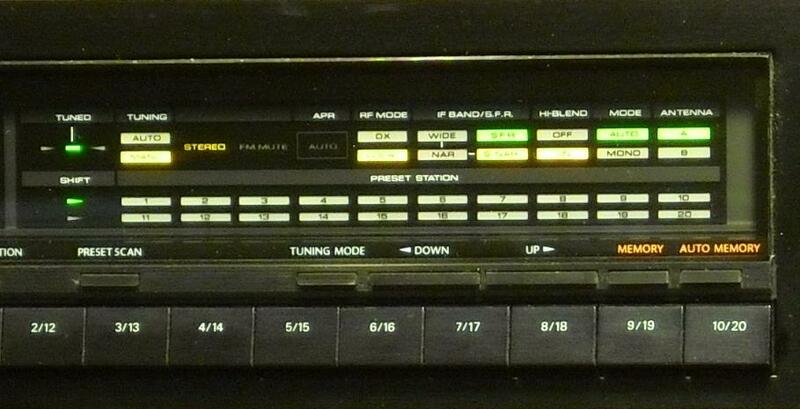 Often the Onkyo would have a station clean, on frequency, when the Yamaha required some off-tuning. 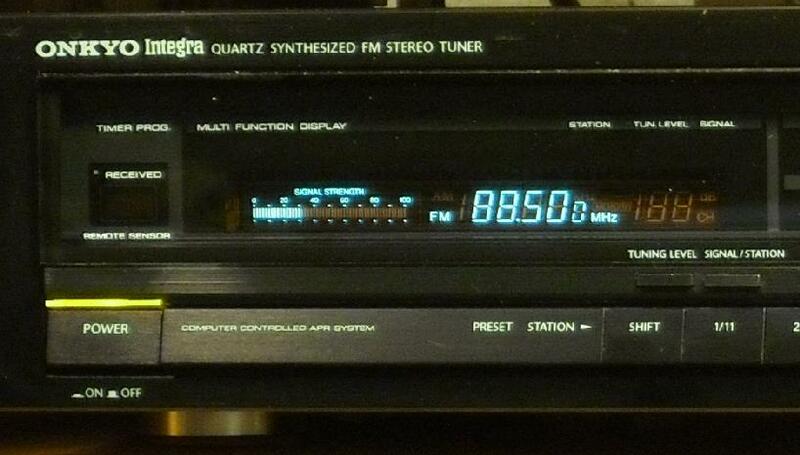 If the Onkyo couldn't pull a clean signal at all, neither could the T-85. In order of sensitivity, the T-4711 and T-85 were more or less equal, then the T-7, TX-1000 (that had recently been aligned), TX-950, and T-1. Both tuners showed about the same level of hiss on distant stations. Both have stereo blend buttons that mitigate some of that. The Yamaha could grab and hold a cleaner stereo signal at a bit lower signal strength. On closer or local stations, both are strong and clear, though the Onkyo is a little more sensitive to multipath in general. AM reception was typically (of digital tuners) hyper-sensitive on both. There's so much signal from my outside long-wire antenna that I have to use attenuators to prevent overloading. 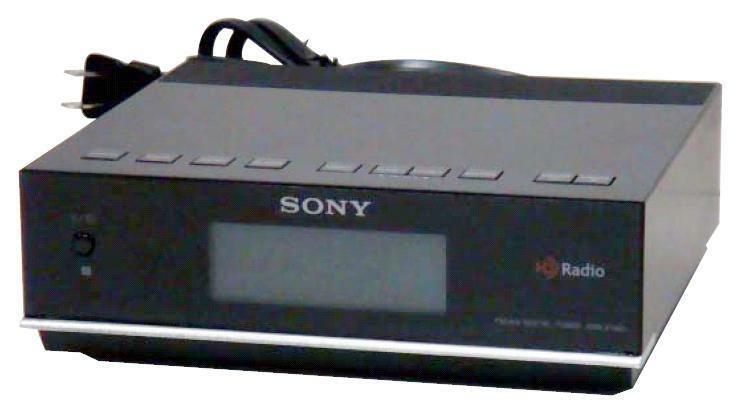 The Yamaha has some advantage over the Onkyo with the ability to fine-tune in 1 kHz steps, but it only tunes to 1620 kHz. The T-85 has slightly stronger mid and lower bass levels. The T-4711 sounds a bit thin in comparison. Otherwise, the mids and highs are quite similar and, overall, both sound very good (though my wife claims I can't hear the annoying dog-whistle note somewhere above 15 kHz emanating from one of our old TVs). So, the winner thus far is the T-4711. But that might be a subjective thing, because the T-85 is so close in all areas, and a little better in a couple." Filter-wise, the most narrow setting of the T-4711 employs two SFE10.7MJK-A (150 kHz 20 kHz tol. ), two SFE10.7MZ2K-A (150 kHz GDT - keep in mind these have much less steep filter skirts - 20 kHz tol. ), and one SFE10.7MX-A (250 kHz GDT). The -A might stand for what is now an "A10", a filter with lower loss. With this kind of lineup, it's hardly surprising that it makes a good DXer. 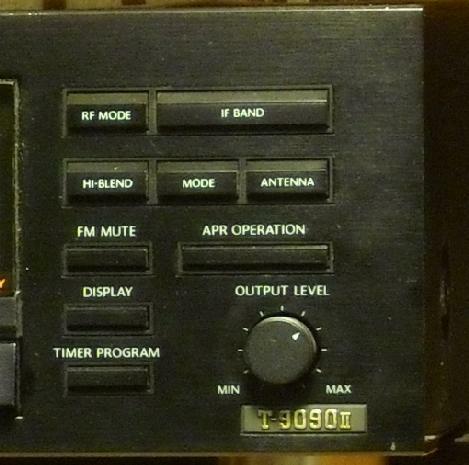 The T-85 uses SFA... filters [230 kHz bandwidth - Editor] in the most narrow position." The T-4711 usually sells for $260-300 on eBay, with occasional lows of $160-170 and a high of $425 in 6/03. A "new" T-4711 went for $371 in 6/07. The T-4711 is fairly unique in display options. In addition to RDS display and search functions, it will show frequency, date and time, station call letters (either via RDS or entered manually by the user), station scroll, and signal strength readout (in addition to a signal strength bar)- by pressing the Display button in succession. The FM-only T-9090 II seems to have a bit more authority in the lower range. The bass sounds just a little stronger than the other two. Otherwise, the two Onkyos sound good to me. The Sony is a little different. In analog, it might sound like the high end has been rolled off, or not, compared to the others, depending on the station. Sometimes it was not a subtle loss of treble on the Sony. Similarly, HD sound varied, depending on the station. Sometimes it sounded better than analog, other times it didn't. Sometimes it just sounded like a digital tuner, and other times it didn't. There was no way to predict any of that. One clear difference is the Sony's quieting. On most stations that had hiss on the Onkyos, it was dead quiet, except for the weakest signals. Sensitivity: Of the Onkyos, the T-9090 II was generally better. It could sometimes pull out stations the T-4711 couldn't hear at all. That surprised me, since the T-4711 is a very sensitive tuner. The T-9090 II would also sometimes hear things the Sony couldn't. But we're talking about signals on the verge of reception- 10 to 20 dBf- often fading in and out above the noise floor. Signals ~5dBf or more above that level would often sound quieter on the Sony, but the T-9090 II was consistently more listenable at the lowest signal levels. Some stations were legible at 11 dBf, some weren't at 25 dBf, especially on the Sony (as measured on one of the Onkyos). Some of that was because of adjacent or alternate channel interference, either from primary signals or IBOC sidebands, and some of it is probably multipath. Selectivity: The Sony was as susceptible to sideband interference as the Onkyos. However, it (the Sony) is more selective than the others. As for HD, it's rare for the Sony to hold an out-of-market signal: strong adjacents interfere with synch. HD apparently takes a lot of clean bandwidth. But there's kind of a gap in my reception- I generally have local HD stations (20 miles or less), or ones 75-100 miles away and nothing in the middle. The T-9090 II has quite a list of functions. It's still missing a few things, though: a tuning knob, and no tuning from the remote. That's a pain. Additionally, manual tuning is only in fine mode. It's not possible to tune in .2 mhz steps. The numerical signal strength only stays lit for a couple of seconds. And basically, it's more awkward to use, compared to the T-4711. This tuner has most of the same options as the T-9090 II, minus one bandwidth and mute level as well as variable audio and multipath outputs. It is remote-controllable, though tuning can only be done from the tuner. Unique to the T-4711 (compared to the T-9090 II) are RDS; switchable displays for station, frequency, time, and sticky numerical signal strength; a tuning knob; more station memory; an overall cleaner face design; and a remote that controls almost every function and at least one not switchable at the tuner (A/B antenna). The remote for this unit is full-function. The Sony, of course, has a minimalist design, lacking knobs of any sort, and sporting a three-bar signal "meter". On the other hand, it has RDS, as well as HD, of course, and a remote control that will allow tuning. Winners (plural) is more like it. The T-9090 II will receive signals the other two simply don't hear. Even when the Sony does hear something, its volume is noticeably lower than the Onkyo at these signal levels. I don't recall the reverse happening- that the Sony would get something the T-9090 II couldn't. The T-9090 II would usually hold stereo on an indicated ~20 dBf signal, which was often its threshold for even picking up the station. The Sony couldn't quite match this performance- it wouldn't get some stations or they would come in at reduced volume. However, above absolute lowest signal limits, the Sony is often quieter on out-of- market stations than either Onkyo. All three are competent on decent signals. On AM, the Sony easily outclasses the T-4711, which overloads on any kind of external antenna, aside from the little supplied loop. Just for comparison, the Sony is a step or two below a Drake R8 in both sensitivity and selectivity, which is a pretty good rating. I would have been surprised if the Sony had won.